Marki Amplified doublers integrate one or two low noise amplifiers with a schottky diode doubler ring, ideal for low phase noise applications. 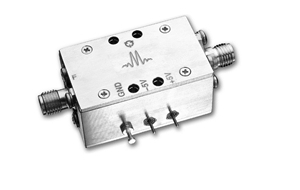 They offer excellent conversion efficiency across multi-octave bandwidths to 50 GHz, with good fundamental and odd harmonic suppression. As with all multipliers and mixers, it is important to drive amplified doublers with the recommended drive level. Electrical Specifications - Specifications guaranteed from -30 to +70°C, measured in a 50-Ohm system. 1It is required that the negative bias be applied before or concurrent with the positive bias. A heat sink is required.